As grandparents and loved ones get older, watching changes in cognitive function, mobility, vision and hearing can be difficult for family members. However, these changes can be especially distressing and confusing for youth in the senior’s life, such as grandchildren. While young children may be confused by why Grandma can no longer drive, or why Grandpa doesn’t respond when they talk to him because he can’t hear well, older youth may be saddened by the changes in an important figure in their life. However, watching a loved one age need not be a frightening experience for youth. By utilizing open family communication and finding ways to keep younger family members involved in appropriate ways, family caregiving can be a rewarding and fulfilling experience for youth. For members of the “Sandwich Generation,” finding balance between family, career and caregiving may be a source of frustration for youth who feel an imbalance of attention. By hiring a homecare agency who utilizes a homecare software or homecare system to help provide care for a senior loved one, parents can help find balance between caring for adult parents and their own children. And, with a homecare software or homecare system, such as ClearCare Online being used, families can still keep in close touch. Utilizing a homecare agency who manages care with a homecare system can also create opportunities for youth to help. For example, by looking at the homecare software Family Portal online, family caregivers and their children can look at a senior’s daily routine together and discuss what they may be able to do to help on the next visit. Or, even better still, discuss ways that younger family members can interact with their senior loved one while Mom or Dad takes care of care tasks. Interactions like looking at family photos on social media or in old photo albums, sharing favorite songs, talking about school activities or even enjoying a special snack together can help foster a relationship and give seniors an important mood boost. 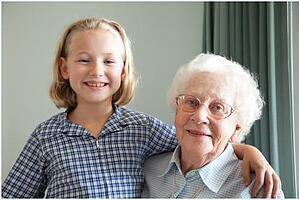 Best of all, by simply being there and interacting, younger family members can be an important part of the care team. By finding ways youth can help – be it in the garden with grandma or grandpa, or helping to make a lunch or dinner you share together, or simply engaging in a fun activity, both seniors and young family members can benefit from youth involvement in family caregiving.